Royal Brunei Airlines (RBA) is eager to move on to the last phase of its new business plan as it becomes the first airline in Southeast Asia to operate 787s. An initial fleet of four 787s, which will be placed into service in 4Q2013 and 1Q2014, will significantly improve efficiency and should lead to a further reduction in losses of RBA’s long-haul network. One of Southeast Asia’s smallest flag carriers has come a long way since restructuring in 2011, when three medium/long-haul and two short-haul routes were cut. So far the results have been positive with RBA’s short-haul operation having already turned the corner and is now growing again in response to surging demand for travel within Asia. RBA is now looking at also renewing its narrowbody fleet, which would result in further cost savings. But the carrier still has an uphill battle in reaching profitability given its small size and the prospect of increased competition with LCCs. RBA currently operates a fleet of four 777-200ERs and six A320 family aircraft to 14 destinations, including 10 in Asia. The 777-200ERs are currently used to serve the carrier’s four long-haul destinations – Dubai, London, Jeddah and Melbourne. 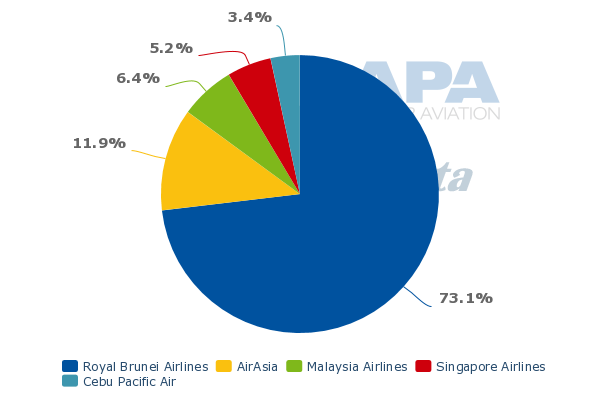 RBA has by far the smallest widebody fleet and network among the seven Southeast Asian flag carriers that operate widebody aircraft. But it will have the distinction of being the first carrier from the region to operate 787s. RBA is using the 787 to re-brand and usher in a new product offering as well as build Brunei into a centre of excellence for maintaining new-generation aircraft. RBA on 18-Jun-2013 signed a partnership with Air France-KLM Engineering & Maintenance which will result in the establishment of a 787 MRO base in Brunei that will work on RBA and potentially third-party aircraft. 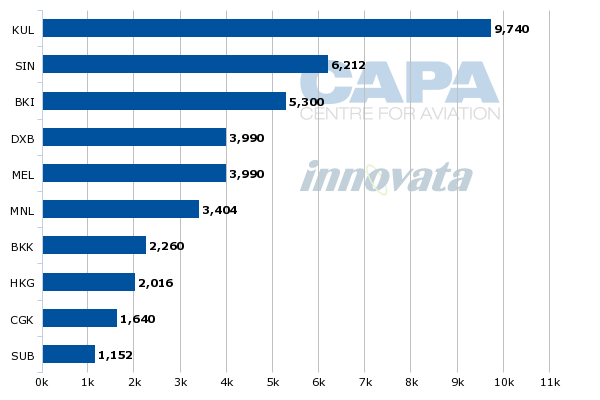 RBA is slated to take two 787-8s in Oct-2013, followed by a third aircraft in Feb-2014 and a fourth aircraft in Mar-2014. This will enable RBA to quickly phase-out its fleet of 777-200ERs, which are leased from Singapore Airlines. The 777-200ERs were an interim solution for RBA’s long-haul network after the carrier phased-out its 767s in 2010. The smaller 787-8 is a better size for RBA’s thin routes and are much more efficient, allowing the carrier to lower unit costs and reduce losses across its long-haul network. RBA will have 255 seats in its 787-8s compared to 285 in its existing 777-200ERs. While 30 seats may not seem that much the reduction should help push up load factors, which are relatively weak at just over 70% system-wide. The 10.5% reduction in total long-haul seats provides a further right-sizing of the network following the cuts from 2011. The 787 will also allow RBA significantly to improve its business class product as 18 lie-flat business seats will replace 30 angled seats. There is a premium demand to and from Brunei but the current configuration is too big. The improved product and 40% reduction in supply should enable RBA to significantly improve its front of the cabin yields across its long-haul network. But it will still be a challenge for RBA’s long-haul network to become profitable. The operation is arguably too small to gain a meaningful economy of scale and the Brunei market itself is too small – even for the most popular long-haul destinations of London and Dubai. Brunei has a population of only about 400,000. London and Dubai are essential destinations for the government-owned carrier. The two cities will continue to be served with a daily Bandar Seri Begawan-Dubai-London Heathrow flight after the transition to 787s on the route in late 2013. But in order to compete with the Gulf carriers RBA has to offer low fares to fill up the seats not taken by passengers heading to or from Brunei. London-Dubai itself is a highly competitive route while RBA’s product from Dubai/London to Asian destinations other than Bandar Seri Begawan has an extra stop compared to Gulf carriers. Melbourne is a strategic destination as RBA sees a need to maintain a presence in Australia and needs a second long-haul route to keep its widebody fleet busy. But the Melbourne-Brunei market is relatively small while the broader Melbourne-Asia market is highly competitive. In order to maximise connections, RBA also keeps a 777 (and from early 2014, a 787) on the ground in Melbourne for over seven hours, which results in lower utilisation and higher costs. RBA has historically had Southeast Asia’s least profitable long-haul operation with the Brunei Government providing significant annual subsidies in order to maintain routes that had no prospect of being commercially viable. Profitability of RBA’s long-haul operation has improved since Auckland, Brisbane and Perth routes were axed. These markets were seen as politically acceptable to cut as an overwhelming majority of passengers were transiting Brunei, primarily to London. RBA previously also served Darwin and Sydney as part of a strategy which relied heavily on kangaroo route traffic from Australia and New Zealand to London. The network restructuring saw RBA essentially exit the highly competitive and low-yielding Australia/New Zealand-UK market. RBA had to offer fares well below cost in this market as Gulf carriers entered and expanded, with multiple frequencies and cities served. RBA continues to operate to Melbourne, which it now serves with a daily flight, and carries some Melbourne-London passengers. But the focus is more on the Melbourne-Asia market in line with the airline's strategy of focusing more on the Asia market overall. RBA’s Melbourne-Bandar Seri Begawan flights currently connect within two hours with flights to Bangkok, Kota Kinabalu, Kuala Lumpur, Manila, Shanghai and Singapore (not all connections are offered every day of the week). Jakarta and Surabaya connections are available within five hours but these would be less important given the backtracking required. Hong Kong and Jeddah are the only destinations in the RBA network which do not connect with Melbourne on the Australia outbound sector. Jeddah is served seasonally and is seen as a point-to-point market catering to Brunei residents visiting Mecca. Shanghai is also not available on the Asia to Australia return sector. All the other cities are available as connections on the Asia to Australia return sector but with layovers that are generally longer compared to the reverse direction. While RBA, as part of the 2011 restructuring, cut its thinnest short-haul routes, Ho Chi Minh and Kuching, it has been adding capacity on some of its regional routes. This has resulted in further improving connections to the long-haul network as well as short-haul to short-haul connections. The regional routes, however, also have a much higher proportion of local traffic and the growth is driven mainly by more local demand. Expansion across the short-haul operation has come as RBA added a fifth A320 in 2012 and a sixth A320 in Mar-2013. The sixth A320 allowed RBA to increase Kuala Lumpur from 11 to 14 weekly frequencies from May-2013. RBA had already increased Kuala Lumpur flights from daily to 11 weekly flights in 2012. The expansion in the Kuala Lumpur market illustrates RBA’s confidence in being able to grow in regional markets with LCC competition. AirAsia has two daily flights on the Bandar Seri Begawan-Kuala Lumpur route while Malaysia Airlines (MAS) has four weekly frequencies. RBA’s expansion in the largest route from Brunei has allowed it to increase its capacity share from only 22% in Jun-2012 to 36% currently. 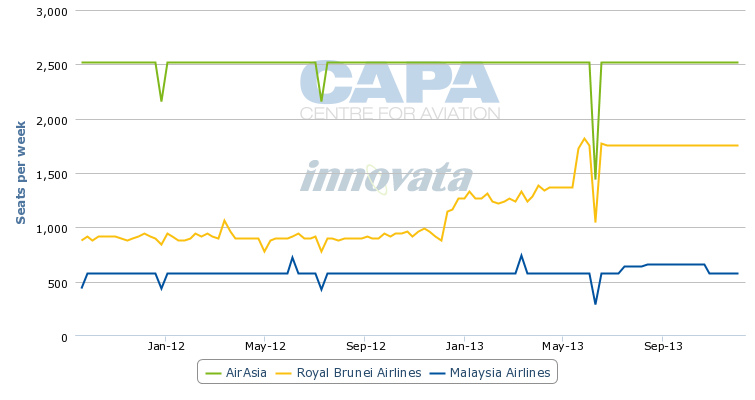 AirAsia currently has 52% share of capacity on the Brunei-Kuala Lumpur route while MAS has a 12% share. RBA sees continued demand for a business class regionally and has adopted a boutique carrier model similar to Bangkok Airways. But RBA is also committed to keeping its costs as low as possible and recognises the need to compete with LCCs. As a result it has implemented pricing strategy that involves competing in the short-haul market on price. Brunei has a relatively low LCC penetration rate, 15%, particularly compared with other Southeast Asian markets. Cebu Pacific is the only other LCC currently serving Brunei. Cebu Pacific currently only operates four weekly flights on the Manila-Bandar Seri Begawan route compared to one daily frequency from RBA. But RBA with its new business model and strategy is prepared for the inevitability of increased LCC competition. Singapore and Kota Kinabalu, which are the two largest routes from Brunei after Kuala Lumpur, will likely attract at some point attract an LCC. RBA currently operates 15 weekly frequencies to Kota Kinabalu and 14 to Singapore. It competes only with Singapore Airlines (SIA) to Singapore and with MAS to Kota Kinabalu. SIA currently offers five weekly frequencies to Brunei, including two weekly frequencies operated with 777s and three weekly frequencies with A320s operated by its regional subsidiary SilkAir. MAS subsidiary MASWings currently operates seven weekly frequencies on the very short Kota Kinabalu to Bandar Seri Begawan route using ATR 72 turboprops. RBA currently operates 136 weekly flights and almost 19,000 weekly seats within Southeast Asia, according to CAPA and Innovata data. Its Northeast Asian network consists of only 20 weekly frequencies across two destinations (Hong Kong and Shanghai) and about 2,800 weekly seats. Its widebody operation currently accounts for about 13,000 weekly seats and 38% of total seat capacity. 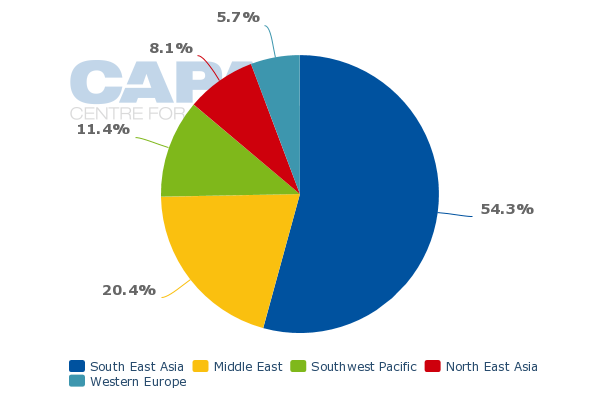 Seat capacity is up 16% year-over-year within Southeast Asia, driven primarily by the additional flights to Kuala Lumpur. RBA currently has a 63% share of capacity in the Brunei-Southeast Asia market, up from 58% in Jun-2012. The carrier’s total capacity share in Brunei is 73% as RBA does not face direct competition on any of its routes outside Southeast Asia. But in the context of the broader ASEAN market, RBA is tiny. Its approximately 35,000 weekly system-wide seats make RBA the seventh largest of Southeast Asia’s 10 flag carriers. RBA’s approximately 19,000 weekly seats within Southeast Asia make it the ninth largest flag carrier in ASEAN. Only Myanmar Airways International is smaller. RBA’s current capacity levels are roughly flat to Northeast Asia, Australia, the Middle East and Europe compared to Jun-2012. This further highlights the carrier’s increased focus on short-haul ASEAN market. RBA carried only 1.1 million passengers in the fiscal year ending 31-Mar-2013 (FY2013). But the regional expansion is expected to drive an increase to 1.2 million in FY2014 and a further increase in FY2015 to 1.3 million passengers, matching pre-restructuring levels. RBA envisions further growth of its short-haul operation in the medium to long-term to as many as 10 new aircraft. RBA deputy chairman Dermot Mannion recently told CAPA that RBA is currently evaluating proposals for up to 10 narrowbody aircraft for delivery beginning late 2015. He says the new aircraft type will be used to replace its existing fleet of six A320s, all of which have leases expiring in 4Q2015 and 1Q2016. Up to four aircraft could be acquired for growth. The carrier aims to select a new aircraft type by the end of 2013. It is currently reviewing information on new-generation aircraft provided by Airbus, Boeing, Bombardier and Embraer. RBA is looking at a combination of lease and purchase option for the new narrowbody acquisition. The Bombardier CSeries and Embraer E190/195 are potentially appealing to RBA given most of its routes are relatively thin. RBA currently does not have any route that is served with more than 15 weekly frequencies. Operating a smaller jet than an A320 or 737 would allow the carrier to increase frequency across its network and potentially launch new or resume suspended short-haul routes. The CSeries and E190/E195-2 easily have the range to operate all of RBA’s Asian routes. The CSeries is also entering service in 2014, hence making a transition from A320s to CSeries in late 2015/early 2016 feasible. The new E190/195-E2 and 737MAX are not entering service in time for RBA’s requirement. The A320neo is slated to enter service in late 2015 but delivery slots prior to 2018 are nearly impossible to secure at this point. This seems to give Bombardier an edge although RBA could potentially extend its A320 leases should it opt for the E190/E195-E2 or the larger A320neo or 737MAX. RBA is also intending to up-gauge some of its regional routes to the 787, using its fifth 787-8. The option of using the 787 on some regional routes, particularly Hong Kong and Shanghai given slot restrictions and the fact these are the carrier’s longest A320 routes, could become even more appealing if RBA opts for a smaller narrowbody. But cancelling its fifth 787 represents the most logical option for RBA. Unlike the first four aircraft, which are arriving within a six-month window, a delivery slot has not yet been set for the fifth 787-8. The original delivery schedule had all five aircraft coming within about six months and the change to a TBD delivery date for the fifth aircraft indicates that a cancellation of the fifth aircraft is possible. RBA only needs four aircraft to cover its long-haul network. While there is some merit in using the 787 for Hong Kong and Shanghai, RBA’s regional routes are too thin for widebody aircraft. If the carrier has an opportunity to cancel its last 787 it would be better off pursuing further expansion of its short-haul fleet and growing its regional routes by adding frequencies. The opportunity to cancel the contract for its last 787 should be feasible given that the popularity of the type and delays in the programme means the aircraft can be easily remarketed. A slim widebody fleet of four 787-8s, which will usher in fuel efficiency improvements of 25% compared to the current 777s, and a new-generation narrowbody should improve the long-term outlook of RBA. The carrier does not disclose financial results but “is getting ever closer to profitability,” according to Mr Mannion. RBA is doing some imaginative things for a small airline that never previously gave serious thought to profitable operations. The partnership with Air France-KLM Engineering & Maintenance and the establishment of a 787 MRO base in Brunei lends prestige and potentially some financial upside. The iconic value of the 787, at least in its early years, should also be a consumer-attractive advantage in generating new business. The carrier's future is practically assured even if it remains unprofitable, as the government is committed to keeping the carrier operating. RBA may never break into the black but it should be able to continue to reduce losses and approach break-even under its new fleet and network strategy – meanwhile guaranteeing Brunei is kept on the map, coinciding with efforts by the Brunei Tourism Board to stimulate inbound tourism.